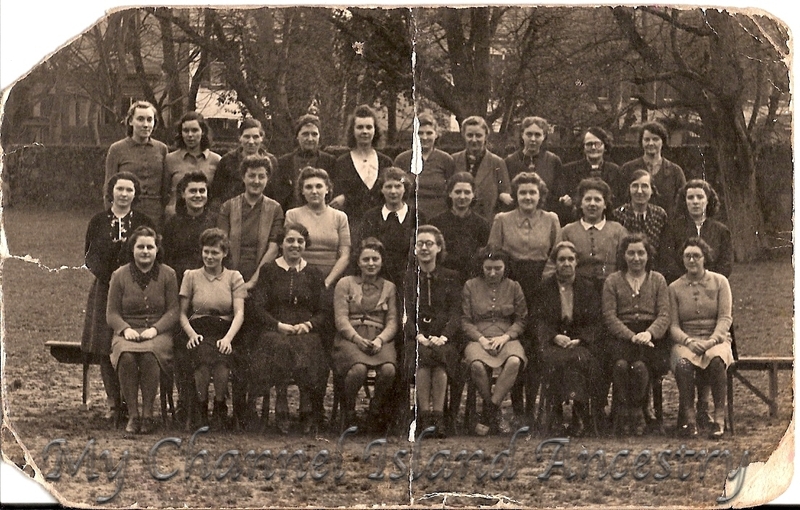 Summerland Factory staff photo – Grace is sitting in the front row 4th from the left. At some point during my grandmothers teenage years she was employed at the Summerland Factory in Rouge Boullion, Jersey, Channel Islands. I know that according to her identity card , on the 16th January 1941, Grace was employed as a machinst. Jersey was being occupied by the Germans at this point. I haven’t been able to find out much about the factory, unfortunately. I did send the photo to the J.E.P. a few years ago in the hope that they would put it in their Temps Passe section. I never heard back from them, which is a shame and not the first time they have failed to reply. It is a shame on the grounds that I sent it when two of my grandparents were still alive, and therefore so would have been more of their generation. It is possible quite a few locals might have written in to give some very useful feedback and memories. So, I use my blog, this website to share these resources with you. Shopping hours were reduced to 10 am – 12.30 pm, and 2 pm – 4 pm, as goods became scarce. Textile shops were open only on Tuesdays, Fridays, and Saturdays. They received limited supplies from France, the Summerland factory in Rouge Bouillon, and from local residents. Textile factories were re-opened to provide employment for local women, as well as supplying much needed raw materials. So these women in the photo above would have had an awful lot of work on their hands. I do not know what work they did exactly although there is a possibilty they made the ‘Jerseys’ and the ‘Guernseys’ jumpers that were often seen worn on the local fishermen. I would love to hear from someone who is more knowledgeable than me in this area, so please fell free to contact me. The fantastic thing about this photo is not only the image itself, but on the back my grandmother had written down everyone’s name! My grandmother’s sister Barbara Rabet is also on the photo in the 2nd row, second from the left. I even think that Betty Boucherie that is in the photo is the sister of my other grandmother Edith Bouchere. I know that my grandmother lost her mother when she was only 9 years old and that at some point she and most of her siblings went into orphanages. I have not been able to find out which ones exactly or the dates but it makes sense that she is working for Sumerland Factory which is right next to Sacre Coeur Orphange. Check out this photo, maybe your grandmother or another relation is in the photo somewhere? Did they come from the Orphange too? If so let me know, I would love to hear from you. HI, I have just enjoyed reading your blog. I was researching Philip O’Toole who was transported from Jersey in 1854/5. The links brought me to the information on Summerland. I worked there in 1983-6. It was by then owned and operated by Peter Sangan who designed a range of men’s knitwear (high-end) labelled ‘Pierre Sangan’ You are correct that the traditional Jerseys were also made there. I believe originally Summerland was attached to or affiliated with an orphanage and the girls from the orphanage worked at Summerland. The Jersey museum has some info on it. I’m not sure when it closed down, but was probably in the 1990’s. Thank you for a very enjoyable read. Thanks for writing on my blog and sharing some great information. I recall being told that Summerland had been an orphanage too, but know very little about it. Your research into Peter O’Toole sounds fascinating, if you discover any great stories, let me know, you could always do a guest post on this blog if you like! 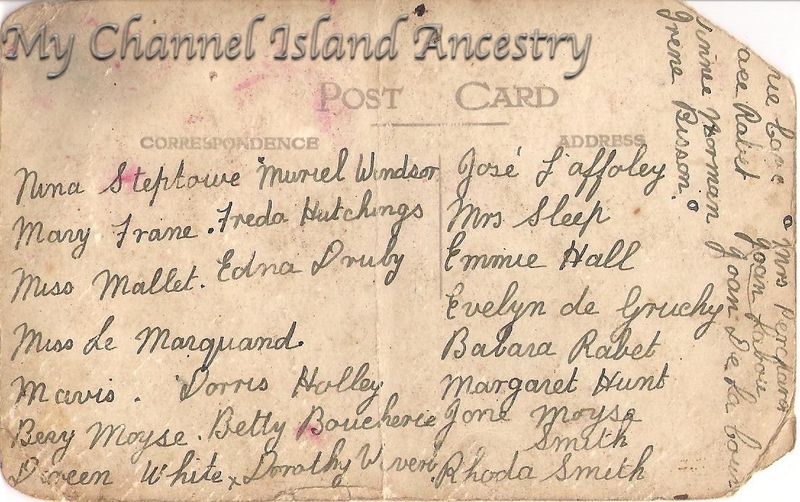 Thanks for visiting my blog ‘My Channel Island Ancestry‘ and highlighting this to me. C.I. Knitwear’s brand name Sumerland was spelt with a single M, confirmed by the label in my jersey..
I’m almost certain that the name in black capital letters on the granite entrance pillars (now gone) at the company’s Rouge Bouillon base was spelt with just a single m, hence the name on the knitwear. Over 50 years ago I regularly waited at the bus stop there, and noted what then appeared to me to be a spelling mistake. Pierre Sangan when did the factory first open? It says the Sumerland factory opened in 1905. Hi, interesting reading. I was managing director of The Channel Islands Knitwear group of companies and led a management buy out many years ago. I originally joined the company working for Bob Sangan, Peter Sangan’s father. When I joined the company, it was still part owned by the Sacre Couer orphanage. Somewhere in my files I am sure that I have records of the company and it’s history. Many of the company files, I passed on to Jersey Heritage for safe keeping and posterity. Thanks for stopping by My Channel Island Ancestry. This post about The Sumerland Factory has been a particularly popular one. I would love to hear more about the place and it’s people if you come across anything of interest amongst your files. Well done too for passing on company files to Jersey Heritage! My auntie irene Bisson is on your picture,so are my mum’s two best pals dorothy white +doreen? , They Were known as dotsie+doreen. My mum worked there too Adele Bisson,she is on another photo found, It looks like a get together in the canteen. Thank you for stopping by my blog. I’m delighted you recognise some family members in this photo. I am researching my late mother who worked at Sumerland during the occupation and was imprisoned in 1941 in Caen for ‘upsetting’ the Germans. She was the Sumerland ARP as she was small and quick. The photo makes reference to a Winnie Norman. My mother was Kathleen Norman. Anything you pick up on this would be useful as I write my mothers prison story. She used to say that Sumerland management visited her in Caen, France with some clothing whilst she was imprisoned.